Ready to turn your space into a glamorous oasis of calm, comfort and chic style? 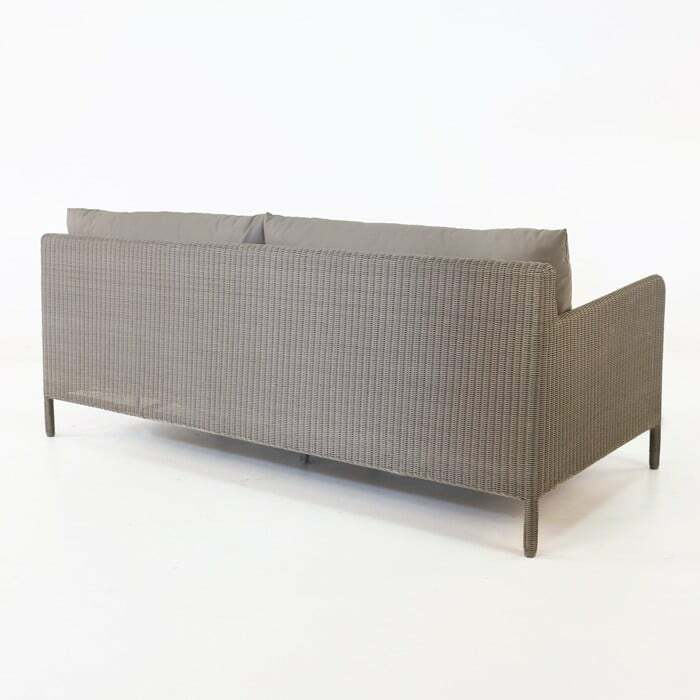 Opulence and luxury are exemplified in the beautiful Zambezi Outdoor Wicker Sofa in soft Pebble. 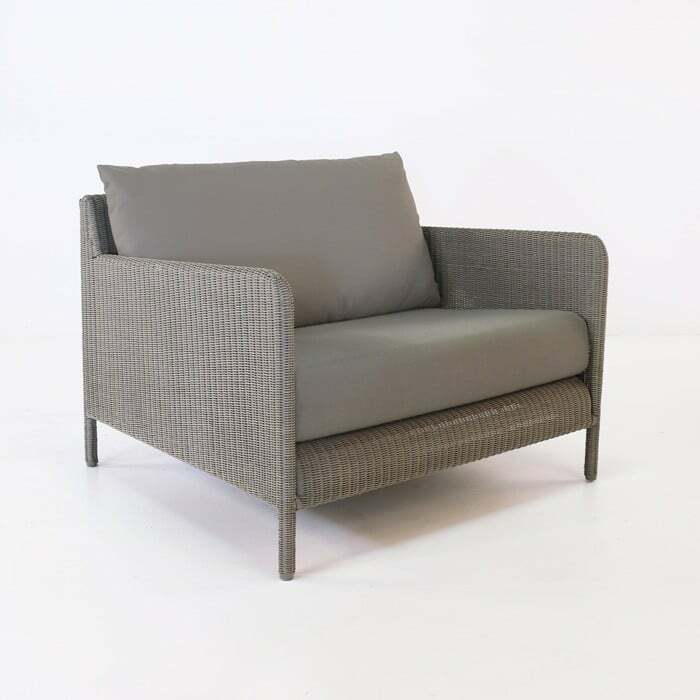 The Zambezi Outdoor Wicker Sofa (Pebble) has become a popular choice for our clients, due to its elegant design highlighting the use of all weather wicker from Design Warehouse. 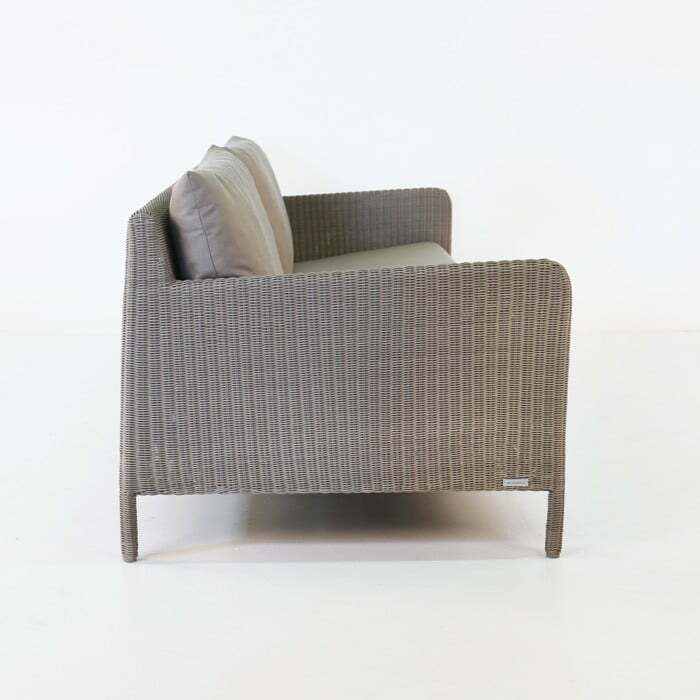 Our Zambezi Collection is chic, incredibly crafted, and a modern and dramatic entry into our expanding range of outdoor seating styles we have on offer at Design Warehouse. Zambezi is all about large, cushy seating with slim lines, showcasing big panels of the slender weave of Pebble All Weather Wicker. The grand look of this unique suite is peppered with modern flair, from the incredible texture of the wicker to the plush Sunbrella® cushions; the Zambezi Collection is a must for turning your space into that beautiful tranquil environment you have been craving. 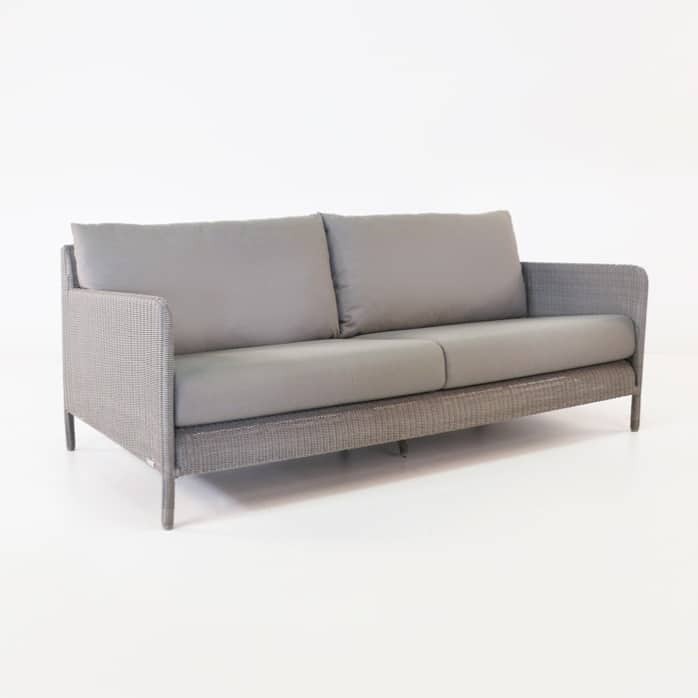 The Zambezi Outdoor Wicker Sofa (Pebble) is made from marine quality materials, meaning that this glamorous suite is suitable for year round use outdoors! 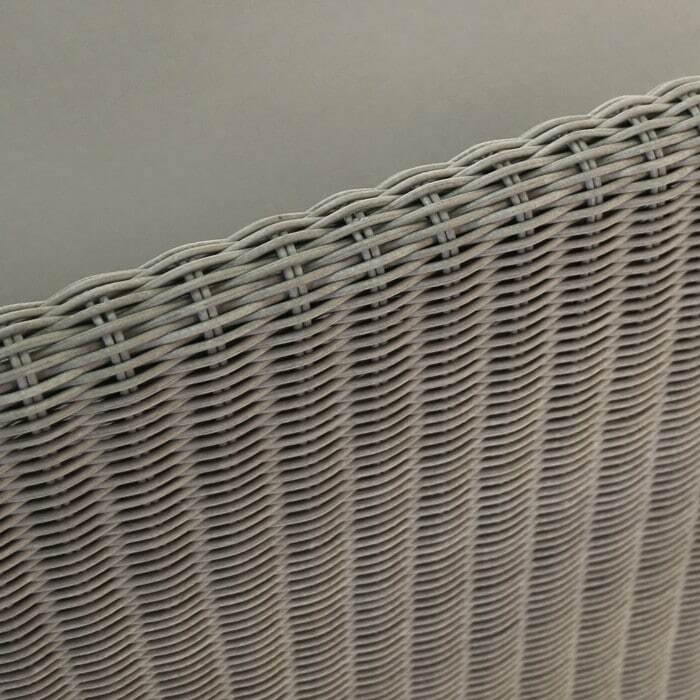 We begin each piece with a hardy powder coated aluminium frame, and wrap it with through-dyed and UV treated polyethylene synthetic fibre in a glorious shade of pebble grey – this is material that wont fade, morph or break in the sun, and enables very little maintenance to keep it looking store new! Simply wash it down with a hose from time to time to get any creepy-crawlies or excess dirt from getting underneath your sofa! Our customers always ask if the cushions are weather proof… But, of course! We are proud to carry Sunbrella® fabric cushions filled with QuickDry® foam chips, enabling you to take the fuss out of having gorgeous, luxury outdoor furniture. 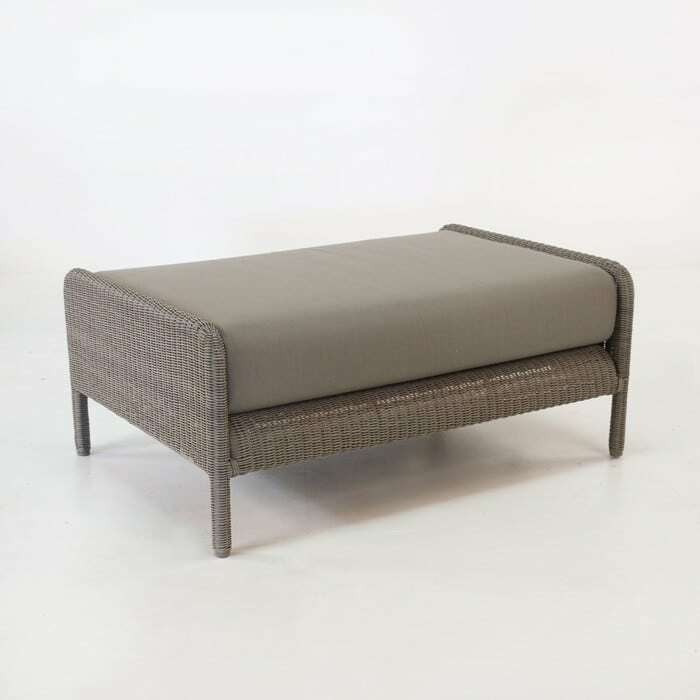 The Zambezi Outdoor Wicker Sofa (Pebble) is the perfect piece to become a central focus in your garden, or patio setting! Create a divine contemporary set up with the addition of a concrete coffee table and framed by two of the plush, lush and large Zambezi Outdoor Wicker Club Chairs in matching Pebble for a comfortable and stylish entry to your relaxing time! The Zambezi Outdoor Wicker Sofa (Pebble) is available now from our flagship store in Parnell, we ship all over New Zealand and abroad. Call us today to order yours!